As much as we love the smell of chlorine in the morning…we do actually worry a lot about our hair and skin and the impact said chlorine has on our pretty faces! ;) We know you are worried too as our post on [how to get rid of the chlorine smell] is one of the most popular articles on our blog. We know you want to protect yourself from the impact chemicals used in many pools have on you. That’s why we are focusing today on protecting your skin and hair from chlorine. Learn these simple rules to keep your skin glowing and your hair shiny after hours and hours of swimming workout. What you might not know is that your hair and skin when dry will absorb water quickly and it will get to deeper layers of your hair and skin. That’s why you need to make sure that you are already wet when getting into the pool. A quick shower before your training will help you protect yourself from chlorine as it will not be absorbed as much by your body. To clean and protect your hair from chlorine use sulfate-free shampoo. Take your time as a quick wash might leave some chemicals on hair. Rinse for about five minutes to keep your hair strong and shiny! You can also rinse it using apple cider vinegar that helps completely get rid of the chemicals – not only chlorine. This is another one that many of you might not know. Outdoor swimming pool allows gases from chemicals to escape into the air making them less harmful for your skin and hair. As an alternative look for well-ventilated indoor swimming pool as they would have the same advantage. After washing your hair you should apply protective moisturizing conditioner to help hair regenerate and keep your hair in perfect health – this will also help it defend from the future impact of chlorine and other chemicals in the swimming pool. 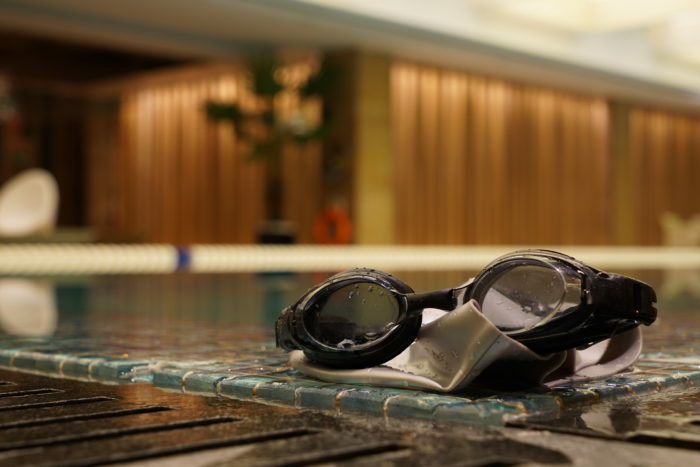 Moisturizing your skin after a swimming session is a must do! Prolonged exposure to water, chlorine and other chemicals in the pool will make your skin as dry as Sahara desert and you have to fight it as soon as you leave the pool. Use natural deeply moisturizing oil or butter for best results. This will also help with the chlorine smell. Hair dryers, as a rule, are not great for your hair. Chlorine from the pool will make the damage even worse! Just use a wide-toothed comb and pat your hair dry with your towel to keep your hair as beautiful as they can be!